McFall & Son Insurance has been running a successful family-owned company in Dayton, OH since 1936. They provide insurance and financial solutions to over 3,000 individuals and businesses throughout the area. They are dedicated to building a solid relationship with their customers through practical solutions and impeccable service. After utilizing Volo Technologies for on-going technical support, McFall & Son Insurance met with our staff to discuss a refresh of their current brand and the launch of a new and improved site. Volo Technologies wanted to make sure the new brand had a fresh look but still contained aspects of the established appearance of their current marketing materials. A new logo concept was put into place and the team then developed the design of the new website. 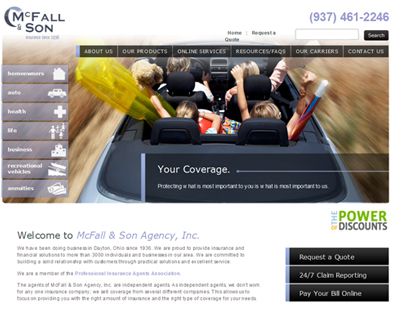 The content management system put in place for McFall & Son Insurance allowed their team to add content and updates to the site, incorporate their social marketing platforms, and ultimately make the website experience more user friendly for their current customers and potential clients. Visit McFall & Son Insurance!